Looks like a '15 center-door sedan! Snazzy! Thank you and others for posting the early photos. In this case it is a 1915 Centerdoor. Note the 3 piece windshield. 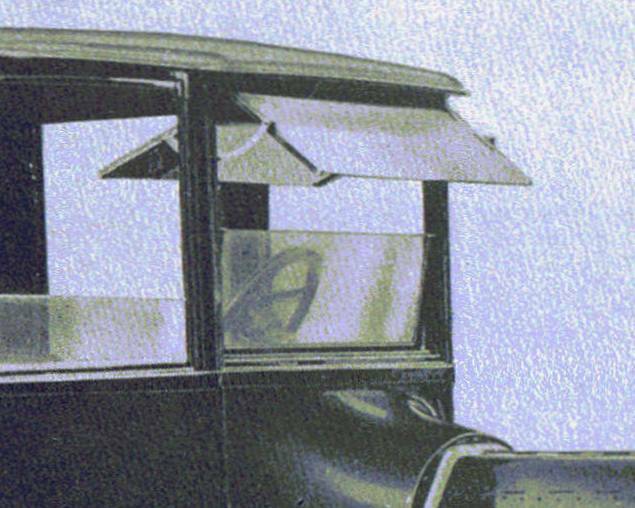 That is not a visor, but the outer top windshield that opened outwards and was supported by a curved brass sliding support. It also has the early side lamp with the larger rim around the lens. If possible - would you please let me know where you obtained that one? I think I just might see a fork mounted electric headlamp? Difficult to know for sure -- but a higher resolution photo might confirm it one way or the other. 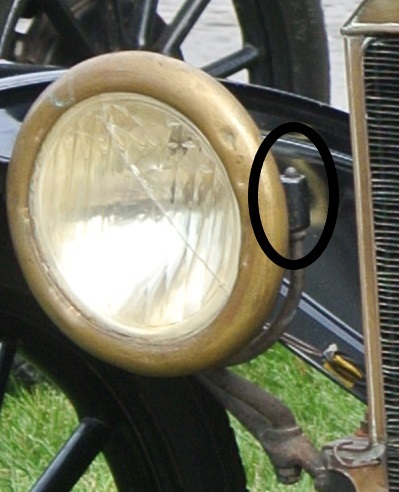 Above is a photo of a 1915 Centerdoor that has a fork mounted electric headlamp. 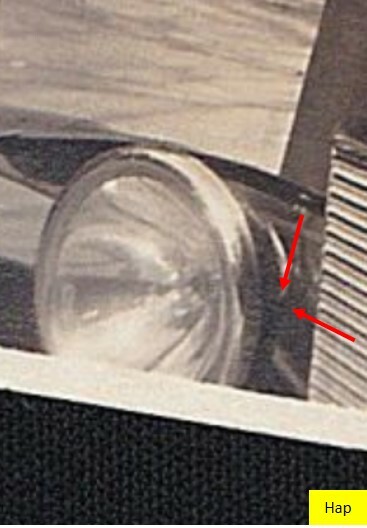 Note the circled area and see the small amount of the fork that extends above the headlamp. I think I can see that same piece of the fork in the photo below. But a higher resolution photo would probably clarify if I'm only dreaming (it is late) or if it is actually there. Again thank you for posting so many great photos. Thank you Jay for sending me a note that you did not recall where the photo came. And that the size you posted is the same size you have saved. If someone has the time, software program, and talent to adjust the passenger side headlamp contrast and lighting -- please let us know if you can or cannot see the top of a headlamp fork where the arrows are pointing. I have an older copy of "Microsoft paint" or something like that - but it is also on the older computer that is currently disconnected. I'll try to get it hooked back up as I also noticed some of the files did not transfer to the new computer. 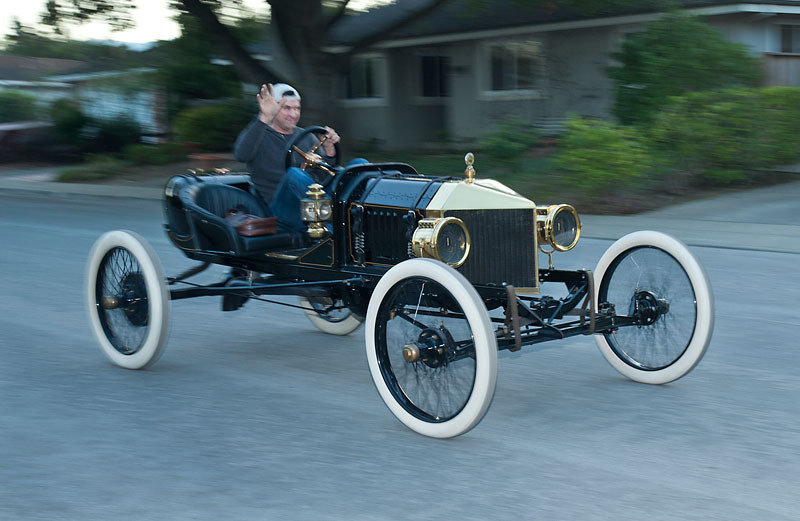 I'm an optimist -- I see running Model T's where others only see junk that needs to be hauled off. And I really do think there is a good chance there is the top of a headlamp fork that will be shown. Jay zoomed in on his copy that is the same resolution as posted and he did not see it. By the way, when I was growing up, it was much easier to know where a photo came from. 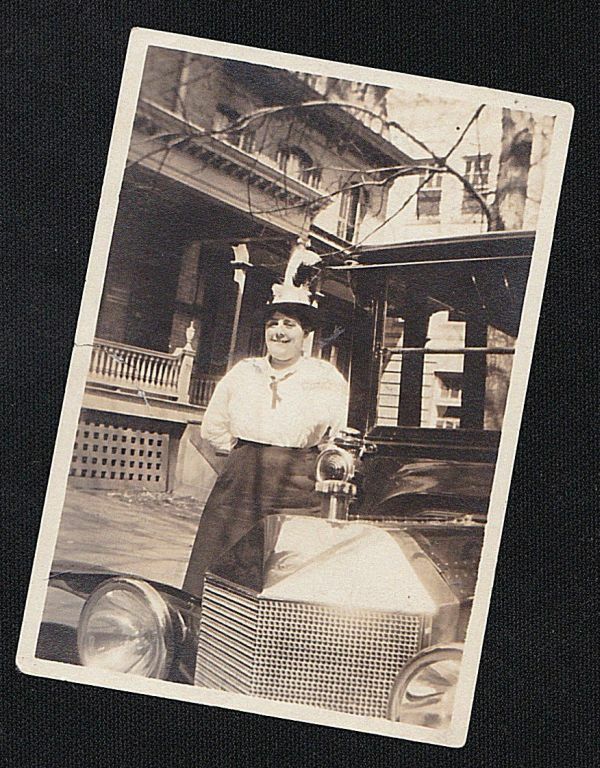 There was a box of photos in the closet. My parents would go through it and say, "This is Aunt Mary, her friend Joyce, Joyce's brother Phil etc." And as the decades past they would say, "This is Aunt Mary and I don't know who those other people in the photo are." And then as we inherited the photos, I would say, "I don't remember who Mom and Dad said that was." But at lease we knew where we found the photo -- it was in the box in the closet. Now it usually somewhere on the internet I found the photo and that is a much larger box. I don't think it is a fork mounted headlight. Nice Livingston V radiator. Seems odd to have a cool streamlined radiator on a '15 centerdoor sedan! Thanks for sharing the picture, Jay. That is to make it go faster (or less slow)? Without getting a better photo or being able to adjust the image/tint etc. Or perhaps new glasses for me would do it also? I don't think we will know for sure. You could easily be correct. But I would love to see a better photo of that if someone comes across it. I've never seen one in person, much less a car with one installed. From pictures I have a love-hate thing going on with the Livingston radiator (especially the brass ones). Cool in more ways than one, but so glaringly angular and ungainly - somehow reminds me of Prof. Fate's car in the 1965 movie "The Great Race". I'd think the implication is that the model T needed extra cooling capacity ? The V tank should hold quite a bit more water, and I'm thinking the radiating surface must be half again the area on a stock radiator. 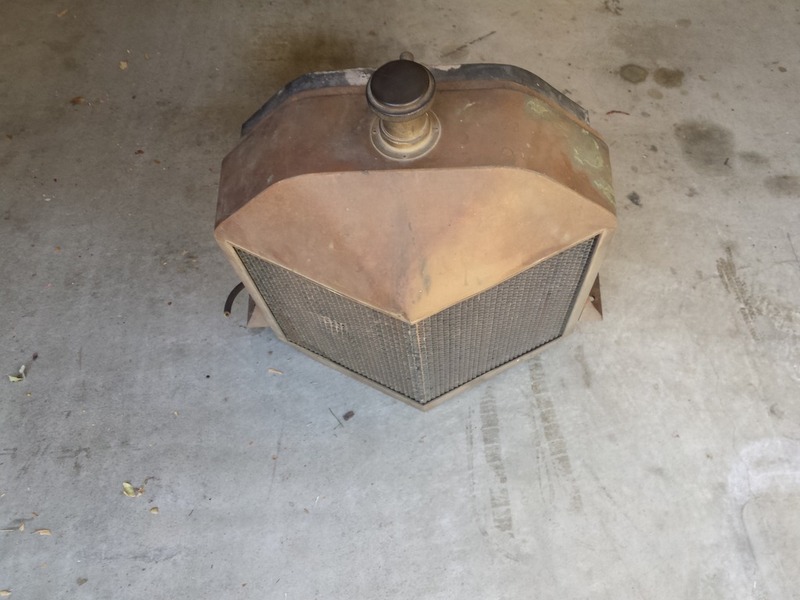 Fun to see the picture, fun to see Ed's radiator. Say, Ed, have you ever run it on a car ? I never ran it, but it was pulled off a running car a long time ago. They are neat. This is a very pointed one on my favorite speedster pic. 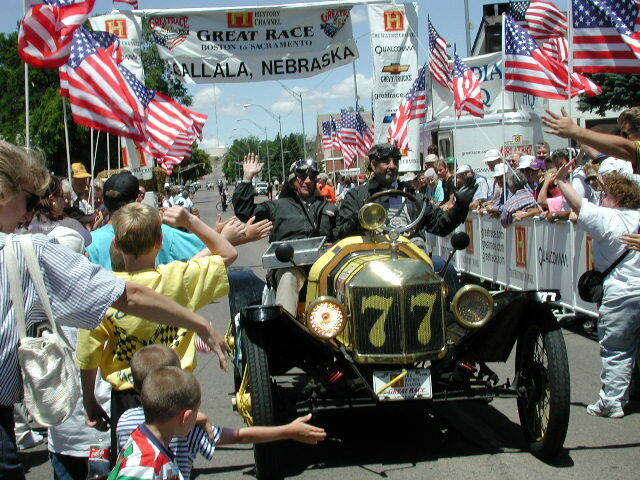 The late Ralph Ricks ran his in the Great Race. It is very obvious that it is a fork mount light. For Erik � thank you for the links. From those I was able to trace it back to an e-bay seller. No surprise, that listing was already closed and probably sold back in 2016. If it had been in a library etc. I would try to get a higher resolution copy. I hope you are correct and that it is a fork mounted electric headlamp (OK � I�m biased). Are you basing that off of what looks like the top of the headlamp fork appearing just above the flat opening on the side of the headlamp? Or is there some other clue in the photo that leads you to that conclusion? Love all the great pix you folks post !! !